That quote is from the press release announcing the publication of the Human Security Brief 2006. 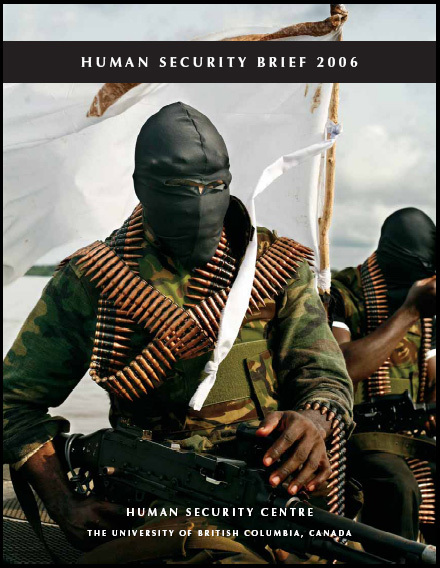 I work at the Human Security Centre, so I decided to read what they’re publishing. I think you should too, or at least skim through and look at the fancy graphs and charts. Also, a hint for anyone writing essays on any conflict-related issue: skim the Human Security Brief 2006, the Human Security Report 2005, or do a search on the easy-to-use Human Security Gateway (that’s my job, adding French resources to the Gateway). Every time I write an essay, the first thing I do is do a quick search for documents and news at the Human Security Gateway website – much better than Google for violence-related info! This entry was posted in Uncategorized and tagged Human Security Brief, Human Security Report Project. you’re so nerdy, it’s fantastic.